How you rank on Google for your desired keywords can have a massive impact on your site’s traffic – and if you’re lucky enough to be the number 1 spot, needless to say, you will get a lion’s share of the clicks. But with this hunger to race to the top of the Google rankings, people have created bad habits and are trying to find shortcuts or “tricks” to get there. Google obviously doesn’t like black hat techniques. Old tricks of the trade like keyword stuffing, creating link farms,etc used to work. However, these are fast becoming pretty obsolete. And while black hat SEOs are developing more sophisticated means to boost their rankings such as PBNs – black hat seo is fast becoming a very time consuming and unreliable means of SEO. Hence, why a lot of providers have turned their back on black hat and gone completely white hat. As a reader of the Ethinos blog, you obviously know the differences between black hat and white hat. But, in terms of purely white hat SEO, what it involves is not as complex or unattainable as some make it out to be. And if done correctly, can yield a benefit far better than any black hat campaign ever could! And your job as a white hat SEO is to continually refine these 3 points, making each campaign better and better. Now does that sound too simple? Perhaps… But there are 2 key benefits of building high quality, relevant backlinks. (1) It acts as “food” for the search engines. If Google can detect through its algorithm and bots that your site is getting relevant, contextual backlinks – you’re more likely to be rewarded with higher rankings. 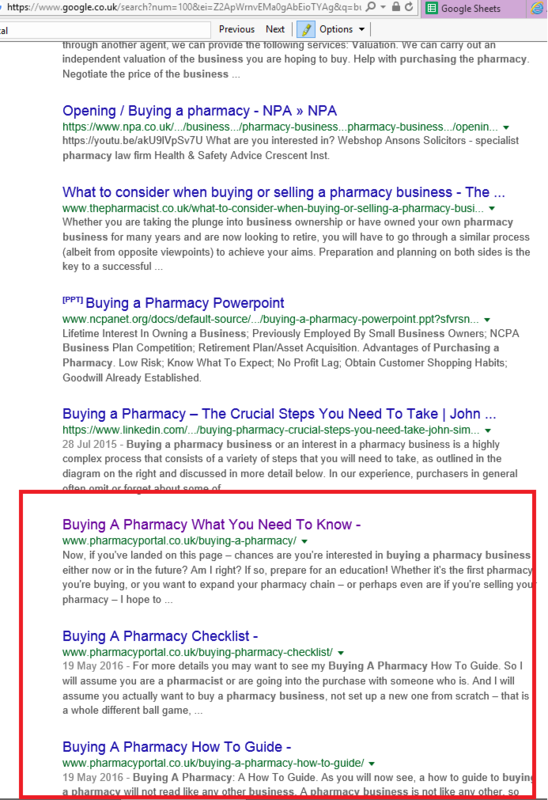 After all, when Google wants to show a result for a keyword, they want to show the most useful content. And these higher rankings will result in higher organic traffic. (2) Direct traffic from the link. I.e. a recent client I worked with had a site which was a guide to arranging funerals. By displaying heavily useful free content in bereavement, arranging funerals and related items – we were easily able to convince suppliers of cremations urns and coffins to link directly to the site from theirs. So before we even start to look at rankings or organic traffic, we’re already getting real people clicking through to the site from these links. Within just a month, not many gains were made in rankings. However, there was a definite upsurge in weekly traffic, which most likely was direct referral traffic from a few links. 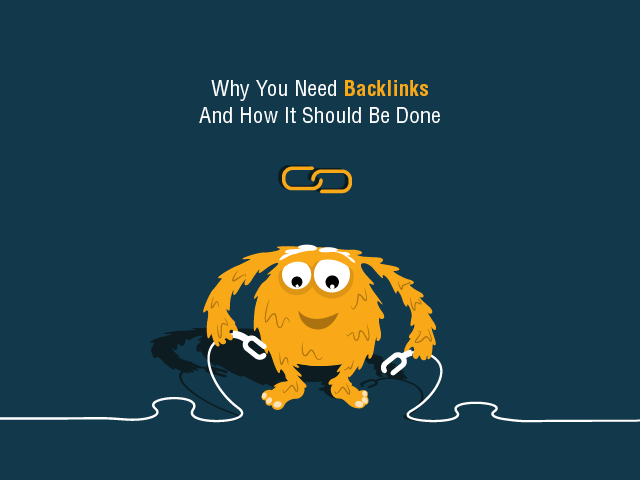 So, we know why we need backlinks – but what is the best way to ensure we can get them? By great content, we mean make it useful for the reader! That means not over optimizing it and trying to make it rank for a particular keyword phrase. Ever since 2012, the Google Penguin update has penalised the over-use of anchor texts. As you’ll see from the article, its probably in excess of 1500 words. It does have decent on-page SEO but I have only mentioned the keyword where it looks most natural and doesn’t make the article unreadable. In other words – people actually find it informative and useful! And when getting this made I had one goal – I wanted this to be the BEST article in the entire internet on how to buy a pharmacy in the UK. There are other article’s out there, but for that particular subject, I don’t think any of them discuss the topic in such detail and accuracy. And as you can see, 2 other optimised (but still useful) pages on the site rank for spots 13 and 14 as well. And by making it truly engaging and useful for readers, it falls in line with the way Google intended. And also, when you reach out to people to link to it, they’ll be more likely to because of how useful the content is. The point being, this is exactly the mentality you should have when creating content for marketing purposes. It needs to most importantly be important, useful and interesting enough that people actually want to read it. If you can achieve that, any link is possible. When trying to gauge, where you should build a link from. There’s just one metric you need to use. And best of all, no subscriptions or fancy tools are needed – its good old fashioned Relevancy. Don’t get me wrong, these tools do have their value when trying to analyze competitors link profiles or for tracking how your site is doing overall. E.g. if there’s a growing trend of your sites DA number going up, its probably a good sign. You’re leaving a lot of good opportunities on the table which would be perfectly acceptable and could drive some very relevant traffic your way otherwise. Having a back-link profile where every link has a metric over a certain number, is in of itself, not natural. Hard to say what effect it will have, but why give Google an extra reason to penalize your site? When doing outreach, what you don’t want to do, is what 95%+ of other people do. Which is usually, going into a large boring sales pitch about what they do, and sharing a link to a sometimes very salesy and questionable article. The first step is to get your content on point (which we discussed earlier). But also, don’t be afraid to actually show an interest in their site! You can have success by just building relationships with bloggers and influencers instead, and even asking them for content ideas. However, its not necessary. Main thing is don’t come across as too desperate or link-hungry. You need to show that what you have, has value for them.Once you can display that, the links will come easily. 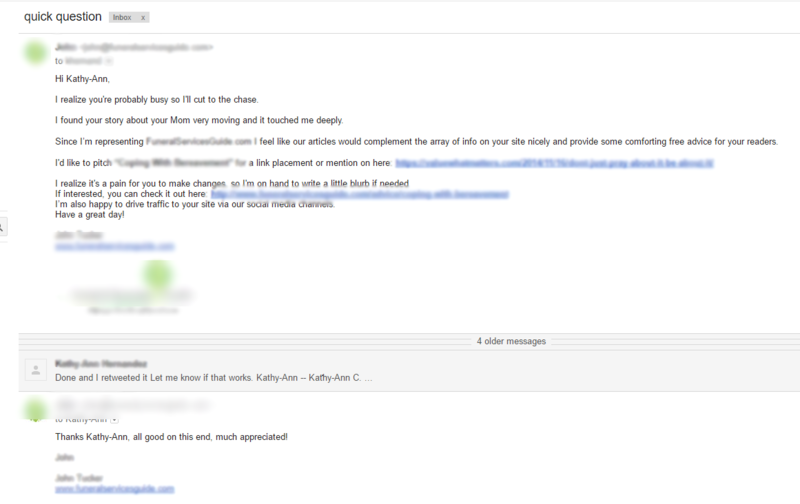 Here’s an example of an outreach email which resulted in a link. Note the personal touch and the fact I personalized the email. In other words – whether its creating content, figuring out who might like your content and then the emails to those influencers – it is ever changing! You have to keep chopping and changing and improving. If the links aren’t coming, then the problem can be with any 3 parts of the process. If you have great content and you know for sure who would like it, but they just don’t seem to be responding – chances are your email outreach is off. Maybe you’re using the wrong terminology or there’s just something with that group of influencers that is not resonating with them, or is putting them off. Similarly, if the content is brilliant and the emails are great ( you may even be getting positive responses) but they just don’t want to link, this might be a clue that the industry you’re trying to target is just not compatible with the content and you may want to re-think your angle. Despite the length of this article and the fact that this is perhaps nothing like the side of SEO you usually see discussed, it is even simpler than the way its presented here. Just concentrate on quality content, reaching out to the right people and just being honest – it really is as simple as that! Thanks for reading and would love to hear your thoughts below!